Florida did not join the union until March 3, 1845, but it shares many of the same growing pains that were experienced in the original 13 colonies. We dealt with other nations holding our lands, the wars for independence, Indian uprisings, and many natural disasters. Many forts dotted our landscape during different periods in our early history. Fort Annuttgeliea 1840 Hernando Co Seminole War fort. for the settlers of this community. During Seminole Indian War 1855-1858. Fort Brooke 1823 U S Army Colonels George Mercer Brooke and James Gadsden commissioned to establish a fort at the mouth of the Hillsborough River. January 10,1824 four full companies from Pensacola's US 4th Infgantry Regiment arrived with Brooke to "Cantonment Brooke". In 1842 now a civilian town was called Tampa Town. Construction workers unearthed an old cemetery of both soldiers and Indians. The soldier remains were reinterred in military fashion and the Indian remains were turned over to the Seminole Indian Reservation for reburial. The Tampa Convention Center now towers over the old fort leaving nothing from the old days. Tampa -(1)From The Gazette-News, Daytona, Fl Jan 05, 1901 pg2 Six suits were filed in the United States Circuit Court Monday by the Hockley heirs to recover possession of the old Fort Brook military reservation, now valued at more than $300,000. The plaintiffs, about twenty in number are children and grandchildren of Robert T Hockley, the original settler of the land in 1823. The United States troops dispossessed him in order to use his house and clearing for a camping ground. Fort Brook became Tampa. Kennedy, History of Lake Co., 1929. Fort Butler- on the opposite bank of the St. Johns near Volusia, was established after the latter was abandoned in hopes that it would prove healthy. But it turned out to be very unhealthy and was abandoned also. As “A Physician” says: “It would seem paradoxical that the miasmatic diseases of East Florida abounding as it does in large swamps and rich hammocks, and exposed to a tropical sun) should generally be of a milder form than those which prevail in more northern latitudes.” [signed] PHYSICIAN SECOND. The National Intelligencer, 8 Nov. 1843. Copied by Ann & Blair Huddart on 31 Oct 1996. NOTE: The site of Fort Butler would be on Route 40 east near the towns of Astor or Astor Park, about 4-5 miles south of Lake George in 1998. Fort Christmas 1835 Christmas on State Road 50, twenty miles east of Orlando. ESTABLISHED: 1835- A log fort was occupied on Christmas Day 1835 in a fight against Indians - hence the name. FIRST SETTLERS: Among the first settlers were J. R. A. Tucker, Albert Roberts, Andrew Jackson Barber, W. J. Osteen, Samuel and Henry Hodges. FIRST CHURCH: First Missionary Baptist Church organized in 1871 with 12 charter members. 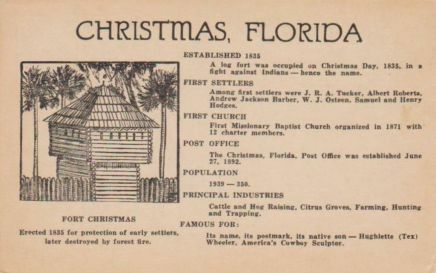 POST OFFICE: The Christmas, Florida, Post Office was established June 27, 1892. FAMOUS FOR: Its name, its postmark, its native son - Hughlette (Tex Wheeler, America's Cowboy Sculptor. states: "On December 25, 1837, a force of 2,000 US Army Soldiers and Alabama Volunteers arrived near this spot to construct a for which was aply named, Fort Christmas. This fort was only one of over 200 forts built during the Second Seminole Indian War, 1835-1842." Fort Chokonikla (also “Fort Chokkonickla” and “Fort Chokhonikla”, now part of Paynes Creek Historic State Park) [1978 Bowling Green] was the first in the chain of forts constructed and was located near the Kennedy-Darling fort site. Chokonikla was the Indian word for "Burned House. None of the fighting took place here. Casualties were due to Malaria, fever, and sickness. The regimental band was garrisoned at one time. Another instance was when 153 of the 166 men at the fort were either sick, under arrest or on detached duty, leaving 7 men to man the fort. General Twiggs, commander of the federal forces, met at the fort in 1850 with Billy Bowlegs, Seminole Chief, trying to affect the removal of the Indians to the western United States. This was unsuccessful, the Seminoles never surrendered. A peace treaty with the United States and the remaining Seminoles was signed in 1936. Fort Drum 1842 Okeechobee Co.
Fort Fannin, in Levy Co. was headquarters of the United States army in Florida during much of the Indian war. Fort George: south Jacksonville, 1736 was built to defend the southern flank of Georgia when it was a colony. Fort Holmes is in the vicinity of the St. Johns, about fourteen miles from Palatka, on the road to Fort King. It was unhealthy. Lietenant Woodruff, 21 Infantry, died here in April 1841, of malignant dysentery. The post was abandoned early in the sickly season of that year. [signed] PHYSICIAN SECOND. The National Intelligencer, 18 Nov 1843. NOTE: Fort Holmes was re-activated, apparently, as it is shown on a map in the National Archives, dated 1859. Source: Fort Holmes Mss Collection, Box 33.P.K.Yonge Library of Florida History, University of Florida.Copied by Ann & Blair Huddart on 31 Oct. 1996. Fort Jefferson 1513 Ponce de Leon was the first European there. He named the islands Tortugas meaning turtles. The park established in 1935 is about 68 statute miles west of Key West in the Gulf and has around 80,000 visitors annually. There are coral reefs with plenty of space to view the underwater history and aquatic life since the whole island is the fort. You might ever find sunken treasure or a shipwreck. Fort King 1827 Ocala Colonel William King was honored by having this fort named after him. The fort, now designated as a U.S. National Landmark is near the corner of 39th Ave. and E. Fort King St.
Fort Lawson burned by the Indians in March 1840. Fort Meade, Polk County played a minor part during the Third Indian War and the Civil War. The loction of the fort shifted over time. The first in mid-December 1849 until about December 1850 seems to have been only two buildings which housed around 230 men at some point. The buildings were very rudimentary and only covered about 22 feet by 38 feet. This site is now a golf course at Broadway and Hwy 98. It appears this site was torn down. The second fort used from the end of December 1850 until in the mid to late 1864 had some burned buildings left around the Heritage Park area. Neither of these locations had surrounding walls. For a view of the coinage and buttons found there visit metal. Fort Pickens was repaired in the late 1960's and reopened in 1976. Fort Pilatka, Putnam Co., was established in 1838 in the town of Pilatka (now called Palatka) after Indians attacked and burned the town in 1835 at the beginning of the Seminole War. It was necessary to control the water route to Central Florida along the St. Johns River. It was later renamed Fort Shannon after Capt. Samuel Shannon. The fort grew to 112 officers and enlisted men in September 1838 and was abandoned September 19th of that year. The men were moved down river to Picolata. Again, the fort was used in 1839. By 1841 there were 408 soldiers stationed there and the fort had a garrison, supply depot and a hospital. Later a military stable was added to accomodate 400 horses as well as eight 30x100 feet block houses utlizing the large virgin timber in the area. As happened often, another fire ravaged the town in 1855. There is only one building remaining of the original fort, the Officer's Quarters, which was relocated to the west side of the Bronson-Mulholland House on Madison St. in Palatka. 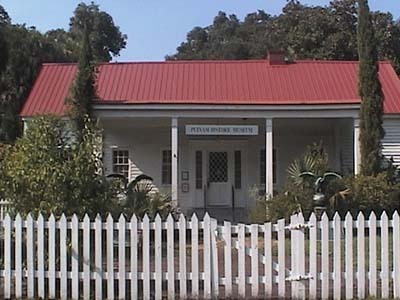 It now houses the Putnam Historical Museum. Fort Shannon see Fort Picolata above. Temporary Fort at Wildwood In order to provide a safe place for the women and children a temporary fort and stockade were built upon the present site of Wildwood and here all the white women and children of the settlement were gathered and spent six months in daily fear of an attack from the Seminole Indians. Volusia, six miles above Lake George, is on the right bank of the river St.Johns. It was one of the most sickly posts in Florida. The men were sick even in the winter, and the mortality in the sickly season of 1836 was dreadful. An officer of the army was dismissed without a hearing for not making a sortie with the Indians near the post. But he was afterwards reinstated and obtained a hearing before a court martial, by which he was triumphantly acquitted. He proved on the defence that there was a great sickness and mortality amonst the troops; that it was with difficulty his well men could bury the dead; and that he was hardly able, with a large company, to keep guard. This post was abandoned and never occupied after 1837. [signed] PHYSICIAN SECOND, the National Intelligencer, 18 Nov 1843. Copied by Ann & Blair Huddart on 31 Oct 1996. · Fort Holmes Mss Collection, Box 33. P.K. Yonge Library of Florida History, University of Florida. Copied by Ann&Blair Huddart on 31 Oct. 1996.